Below is my preface to the book. There is such a huge literature on Jews that it makes one wonder whether it is necessary at all to add more books on this subject. For the most part, the literature on Jews, at least as far as our postmodern discourse is concerned, depicts them as eternal victims of irrational prejudice by non-Jews. Hence, Jewish victimhood—either real or surreal—must now be projected worldwide as an educational tool for preordaining Jews as moral pillars of all of humanity. In addition, these perpetual victims must be appointed to serve as the conscience of always aggressive and unpredictable Gentiles. Even the literature critical or hostile to Jews, which as a rule carries the label, “anti-Semitic,” plays an important role in bolstering Jewish identity. Were there no more anti-Semites around, it is questionable how much longer Jewish identity would survive. Likewise, if all present anti-Semites were to disappear for good, a new brand of anti-Semitism would likely need to be invented. Similar recourse to the adjectivization of the noun “Jew” is taking place in French and German speaking media and scholarship.Merely mentioning the German barrel-sounding and prolonged two-syllable noun “Jude” ( “yoo-deh”) — no matter what the context — or the shrill French one-syllable noun “juif” /ʒɥif/, even if no Jew-bashing is intended, sounds disturbing in the ears of Jews. The intention is clearly to inhibit discussion of Jews at all, whether legitimate investigations of Jewish power and influence or the ravings of mentally deranged anti-Semites. Keeping this in mind, it comes as no surprise that ever since its founding, the ADL has maintained a keen interest in having the last word in shaping public discourse—first in America, later in Europe. 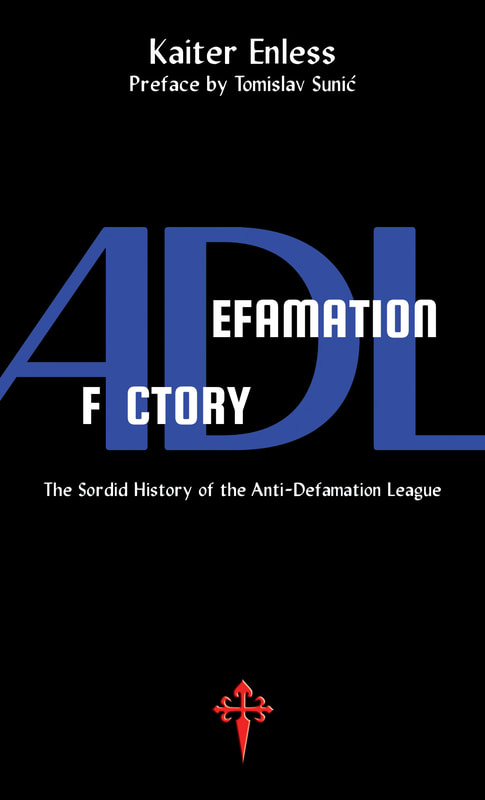 Having realized the power of words the early founding fathers of the Anti-Defamation League, decided to adorn themselves with this nice, abstract, flowery, and lachrymose title, thus providing a veneer of impartiality for public consumption. It avoided labeling itself with an earsplitting qualifier like “Jew” or “Jewish.” The hypothetical, albeit more appropriate denomination i.e., “the Jewish Anti-Defamation League”, would barely have the same resonance of impartially for Americans today. For readers who grew up in the former communist universe, the awesome similarities between the former communist newspeak in Eastern Europe and the present ADL newspeak in America cannot be overlooked. Enless’s book offers a handy overview of ADL activities over the last century in America. This semi-secretive organization has managed, under cover of a humanitarian jargon and tolerance preaching, to cover up its own, often murky and criminal affairs. Enless’ book reads like a police report on a guilty suspect, yet the suspect never ever considers entering a guilty plea. Instead, the suspect deftly reroutes criminal charges against him by declaring himself a victim of hate. Thus, Leo Frank’s murder of Mary Phagan in Atlanta in 1913 and his subsequent lynching by an angry mob came served as an excellent test case that legitimized the future activities of the ADL. The book also sheds light on the verbal inversions carried out by the ADL and its non-Jewish minions and how their linguistic manipulations result in the inversion of political reality. Or to put it more academically, verbal inversion always leads to the reversal of a thesis. This is particularly true in the modern Western judiciary and scholarship which are becoming more and more inclined to arbitrary decision making, always ready to clamp down on free speech advocates by declaring every nonconformist thought offensive or criminal. For instance, Henry Ford, the famous American car maker, who is also mentioned in the book, along with thousands of unnamed American activists, was also the subject of such thesis reversal. The ADL had initiated a smear campaign against Ford after Ford himself had first drawn attention to legal improprieties of the ADL. The last chapter of the book leaves the reader holding his breath. The new viral world of the internet opens up new avenues of dissent for free speech advocates. It’s no surprise that the ADL is doing all it can to silence intellectual dissent in this new medium. Imagine the effect of that. Earlier this year, seven representatives of various pro-Jewish groups convened in Vienna. The main machers of the Jews and their goy ” coalition of the willing “. Of course Kenneth Jacobson, Deputy National Director of the ADL was also present. W A R N I N G S ABOUT ANTI-SEMITIC CONTENT. [ scape ] goat on its front emblazoned with THEM, being pointed at by six hands: that’s us. The complete antithesis to the book under discussion here. For fullest enjoyment, you need to go to IRVING ACTION REPORT ONLINE, which links to the relevant Daily Mirror site, with its multiple germane headings. Before you pet your dog, revisit Irving and read of the ten year sentence given to the Jewish-American dual-national, but mono-loyal David Kadar for 2,000 worldwide threats. For 500 US he would make a bomb threat for anyone: for those on a tight budget, a mere 45 for an ordinary threat; preferably in Bitcoin. It must have been to the chagrin of the New York Times, to publish this sentence, which daily coined its slogan ” all the news fit to print “, despite the prevalent view, that it fits all the news to print. Impossible in a court-cited sentence. Its article omits the name of the sentenced, which was common knowledge to those uncommonly curious. Perhaps you’ve heard of “K Street”, K9, aka 911, and KKK or 33; these are all Jewish creations. 9 11, refers to 20 which is the ‘master of the Serpent 10, aka 19/10 or 55/10. Here’s a key for those interested and trust me, we should ALL be interested as they’re pulling these ritual murders almost monthly; it now includes high school children. This is sorcery BS that needs to be exposed and STOPPED; they also kill their own tribe members as required! This was hard for me to wrap my head around as I was “too smart” to believe in witchcraft and while much is crap, the sorcery, aka “Craft” of Masonry is quite real! Who is Keiter Enless? Or is that a metaphoric Nom de plume? Tom, Kaiter Enless, with an ‘a’ in the given name [ an irrelevant typo by Dr. Sunic ], is a somewhat less common name than John Smith. Surely you have, or can get access to the net. Lengthy videos. I used to think the ADL meant Arab Defamation League. They have now broadened their attacks to include anyone with the capacity to see through the multiple scams being run by tribal members. Dr. Sunic states the author “explains a specific Jewish binary behavior: constant fear of sudden anti-Jewish outbursts on the one hand, and, on the other, the obsessive Jewish quest to suppress their critics, whom they label “anti-Semites.” I believe it is much simple than that. It seems Jews are hard wired with a need to control others. I am acquainted with a number of Jews, both male and female, who work in large workplaces. Most of them are not part of a supervisory structure, yet the overwhelming majority of them seek to control their workplace by influencing their supervisors and co-workers to do things their way. In short, it’s all about control, the ADL just has bigger ambitions. I wonder how big a wall the ADL has around their offices in Washington D.C. or wherever they are? I wonder if they ever, ever will be able to understand how angry gentiles are that they are pushing open borders on us and trying to replace us here in the US? Will they ever figure it out, that it is their behavior that causes people to react to them in the historical ways they do? I hope they do. I hope they can see that millions of Americans are waking up and we are not going to stand for their bs anymore. I really, really hope that they can figure it out before we have to put them on airplanes and ship them to their homeland. Enjoy that wall. Maybe the ones that aren’t involved in replacing us can talk some sense to the other ones? Tribe member to tribe member? You have no idea as to the scope of this criminal crime network; it goes back, way back, and includes #JewishSenoreaters. What percentage of our law enforcement has been filled with these psychos and mind control drones? If you speak their numeric ritual Qabala lingo you can prove 7/7, and many others were Mossad operations with local assists as well! Did you know it’s seriously ‘bad luck’, as in DEAD, for those with talent/money to have a #JewishSenorita? Here’s an incendiary post that needs more air time. 1) Jewish boy tells story of friend’s friend that ‘loved maiming babies’; in the description he told of nearly being killed in a human sacrifice in the cult of his parents. 3) Jewish senator demands “children as collateral”; another, and Governor Brown, facilitate child trafficking coverup by handing off to police who they control via masonry. Please make a separate post and/or back this comment up, as the traitors at Google, and Youtube, have been caught randomly deleting my comments from peoples blogs. Shows who’s behind Google, and behind these murders and treason; don’t hold your breath waiting on Trump, as he’s one of the ‘fellas’ that will likely aid in our demise as he’s done so far. You can tell I’m over the target due to their having sent their Masonic cops and WITCH divisions after me! I think one strategy open to us is to go straight to the heart of the matter; to the things no one can avoid. Then show how our response to those things support freedom and justice or not. The best place to start is with Explanation. All explanations that lead to totalitarianism focus on “causes” and those that support freedom emphasize consequences. Dogmatic explanations talk about “causal forces” in a wholesale way. It’s either pre-scientific, extra-scientific, antit-scientific, or pseudo-scientific. It’s fundamentally pre-modern and regressive. Pragmatic explanations talk about the relationship between human nature and cultural conditions, their facts and consequences. It’s truly progressive. One has a commitment to reality, the other to fantasy. One is akin to the experiments of a chemist, the other to the dreams of alchemists. But, above all, one is adaptive, the other is maladaptive. Dogmatic thought leads to Authoritarian action. Pragmatic thought leads to free inquiry, open dialogue, a search for mutual interests and an increase in civil social interaction. The point is to focus our intellectual energy on the procedural, not the personal. From there we can swoop on particulars and see how this plays out in the social arena where objectives are realized. We can simply lay out such tools for the public to consider (spread the word far and wide, in comment sections, etc) and let it go at that. Let the public decide which one is healthy and which one is unhealthy; which one is sane and which one is insane. Just my two cents. Every little bit helps and we could use all the help we can get. I’m sure folks out there much smarter than me can do a lot more with these ideas designed to help drive the nail in the coffin. You’ve gotta be in to win. Since it has gone this far, they are probably thinking it is safer for them to see the plan through to the end. What exactly is hate speech? Do they ever wonder why someone would use hate speech and why they hate some other group? Just like how everyone hates the Jews but we aren’t allowed to discuss what causes people to hate Jews in the first place. As much as I am grateful for the Second Amendment, thank God for the first Amendment. I disagree with this- “While it is today acceptable to talk in general about “German crime,” or “Russian crime,” or “American crime” without criminalizing the entire German, Russian or American nation,”. I have lived my whole life knowing that I am guilty for the holocaust and must live in fear of these satanic lying criminals. They hang it on all of us while they steal from us and kill us in their wars while the destroy us morally. They make sure we know we are all forever guilty when the true guilt is theirs. Many years ago I came across a story of a middle aged man about to leave Tel Aviv and fly home to Scotland. At the airport he was asked by Israeli police if he’d mind answering some questions, he accompanied them to an office, it was the last time he was seen alive. His elderly parents in Edinburgh first reported him missing. They said he was single, aged in his late 40’s and made a living as a dealer in, from memory, antiques, which meant he did a lot of travelling and said he always had at least about $5,000.00 in cash with him wherever he went. Eventually, and this took quite some time, Israeli Police acknowledged the man had in fact expired at the Airport and for a fee of some $5,000.00 they would arrange for the body to be flown to Scotland. The old folks were appalled at the outrageous cost of this and haggled for some time, to no avail. The body was returned to Scotland and an autopsy was performed. Naturally, his parents were anxious to know why their hitherto healthy son had so unexpectedly gone to his reward. The Doctors were puzzled on examining the body, reporting that cause of death could not be determined, it was, ’empty’. The heart, lungs, and liver had been expertly removed from the body and there was no sign of the ‘at least’ $5,000 in cash he always carried with him. The outraged parents complained to anyone who’d listen but Israel stonewalled everything. The implication here is clear: Israeli Airport security profiled middle aged well dressed and unattached men. Often no next of kin, no spouse, no children such individuals are not greatly missed, so ‘offing’ one is unlikely to come back to haunt them. When I first read this, long before I became ‘wise’, I thought, ‘my God what monsters!’ ‘They suss out a target in an International Airport, murder him and have his organs removed in addition to any cash or valuables. So its not just a few villains at the Airport, it’s the doctors who harvest the organs, then there’s the Hospital which stores them and a coterie of others who must know! I suspect readers here may also remember this incident. It’s only a tiny percentage of us who know of such things. No wonder they control the Media all over the World, they must to keep the truth from the Goyim. It’s only fitting, that Tel Aviv’s International Airport is named after the documented terrorist Ben Gurion. It’s almost irrelevant, that said art dealer may have spent part or all of his cash on purchases. They had his passport. The local UK Embassy was obligated to bring his remains home immediately, at their cost, after the Israeli Police notified it. If the parents paid an additional 5,000 in costs , as well, then this was not unheard of unmitigated extortion. Literally during our farewell dinner at the Grande Bretagne Hotel, in Athens, before I put my group on a flight back to the US, we lost our member Ossie Thomson from Eugene, Oregon, due to heart failure. Two hours after I notified the US Embassy she was taken away, to be returned home by them. Not a single word about costs. I vaguely remember the incident brought up by you. Being an inveterate Haaretz reader, I also remember their covering a story shortly thereafter, of a dozen or so former IDF members, [ ” the most moral Army in the world ” ] headed by their former Commanding Officer, illegally harvesting and selling body organs, with enormous profit. But then why wouldn’t you, if you detain, without indictment or proper records, ca. 20,000 Palestinian prisoners, including children. Kept in storage at the American taxpayers’ expense, and through Jewish community funding: with its swinish Talmudic ” moral ” underpinning. None of the insider books reviewed here, has divulged much or anything on their Halacha, or religious law, as applied throughout the diaspora, here and now. As a serious but small c Christian, I have yet to run across a section of the scriptures, separately entitled Christian Business Law. In contrast, you should google ” Business Halacha ” ; while seated. A website identical in design to ours, including sub-headings. Fortuitously, the above site has a free service to ask any Rabbi of many on the pictured staff: though likely not accessible without a few words in fluent Hebrew regarding secret ingredients in the kosher preparation of gefilte fish. Interest between and among them is forbidden. No problem. The Lender and the Borrower simply term themselves partners in a given venture, with profit [ or loss ] to be shared equally. Far from being a recent, practical and profitable end-run around their Halacha, this business model was approved by a Rabbi of Krakow, some 400 years ago, known as Heta Iska, to overcome the ” abomination ” of Ribbis, or interest. Interest in Hebrew means ” bite “. I guess foreclosure comes from the Hebrew for gulp. Quicken Loans, North America’s largest mortgage and credit lender this year instituted a Heter Iska. Use both key words to look it up. Query 1: Are the religious officials involved practicing law without a licence? Query 2: Does this allow members of one religion to pay taxes at a lower rate [earned income] than those of other religions that are taxed at a rate applicable to interest income in those jurisdictions that so differentiate, e. g., Massachusetts? @ Tadzio hopefully doesn’t stand for a tad Zio. Q 1: These ” religious officials ” can come from any calling; including law. They need to be well qualified in Business Halacha in particular; usually Rabbis. When some unforeseen circumstances arise, forcing them into the realm of the state’s judiciary, they plead, via licensed attorneys of their own firms, that their own Halacha be at least considered in the reasons for judgment. Q 2 : I would have to conjecture, which I despise in others. But why don’t you avail yourself of the free advice by one of their Rabbis, offered on their website. THEN TELL US ! Of course structure your question neutrally. You’re helping a sophomore niece with her term paper. E-mail would be preferable over a phone call, which would place you at a disadvantage. First, get some of their terminology straight by watching the shorter of the two videos on the site quoted above. Then: Business Halacha hotline. [ Contacts ]. Pay attention to Ron Unz http://www.unz.com and his American Pravda articles. He’s the one to watch because he’s a Jew and he’s doing something the world hasn’t seen since Henry Ford was forced to abandon his International Jew series. Unz’s “red-pilling” on the JQ began 6/24/2018 with The Remarkable Historiography of David Irving, and it keeps getting better and better. My path to knowledge began with Harry Elmer Barnes and the slender posthmous paperback, Historical Revisionism: The Key to Peace. At the end of his life Barnes estimated that out of every million people, there might be just one person in that group who would never lie. Barnes was such a man. I think Ron Unz could also be such a man. Paul Craig Roberts has called Unz the bravest man alive. Right now I’m reading Shlomo Sand’s The Invention of the Jewish People, Michael Hoffman’s Judaism Discovered, and David Duke’s My Awakening. But I’m disappointed that Michael Hoffman who makes such a big deal of whining about plagiarists who didn’t publicly credit him doesn’t mention Elizabeth Dilling and her books on the Talmud and her The Plot Against Christianity.